An overview of information about contractor parking permits issued by Parking Facilities for use at Purdue is included below. The appropriate Purdue project manager will authorize one or more contractor parking permit specific to a job site, and the contractor will need to take this authorization to the Parking Facilities office for completion. Each contractor parking permit costs $83.33 per month, and the expiration date will be determined by the duration of the project. Full payment for the designated parking permit timeframe is required at the time of purchase. Permits for spaces posted for contractor parking in the lot in front of the Printing Services Facility (PRSV) may only be purchased directly from the Parking Facilities office. Restricted contractor permits are available at the following rates: $25 for three months, $50 for six months and $100 for 12 months. It is be the responsibility of the permit holder to purchase a new permit upon expiration. Vehicles may not be stored in any parking lot or garage for longer than 24 hours without permission from the Parking Facilities office. Any vehicles in violation of this may be towed at the owner's expense. Jobsite equipment is required to be stored within the jobsite limits. No equipment may be stored in campus parking garages or lots. No refunds for contractor parking permits will be issued. Questions may be directed to the Parking Facilities office at (765) 494-9497 or parking@purdue.edu. 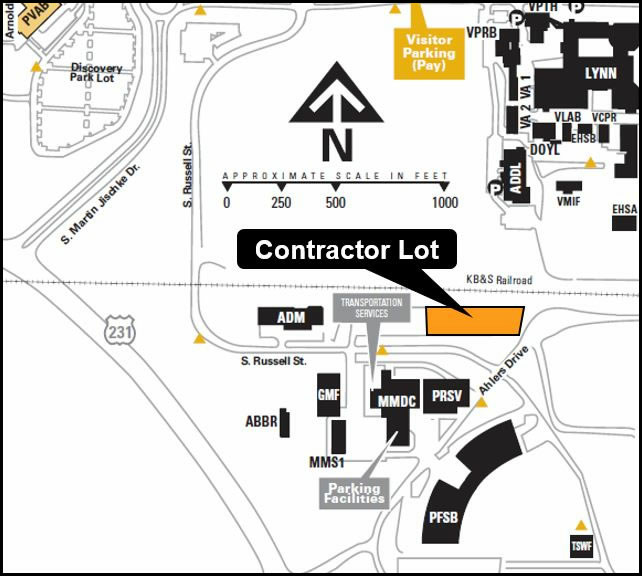 Contractor parking is located near the Printing Services Facility (PRSV).